Spotted this at the local McDonald's and decided to give it a try out of curiosity. Perhaps due to the shaking about during delivery, the burgers arrived in not-so-presentable state which to me is not a big deal. 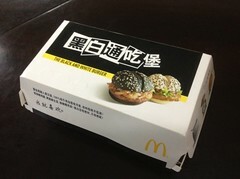 So we have twin mini burgers where the black one was supposed to be squid-ink white sesame seed bun with a beef patty with black pepper sauce. Not bad. 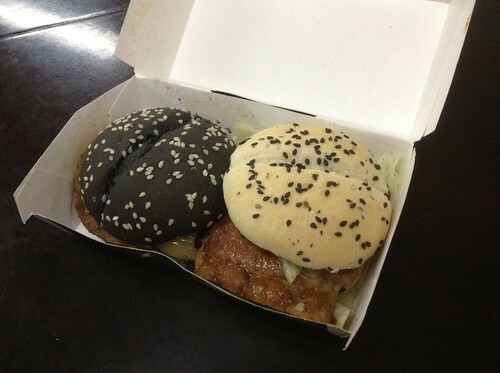 The other is your ordinary white bun with black sesame seed for contrast and a chicken fillet in it with a savoury sauce. Oh and the token leaf of lettuce to make the meal "more balance". Overall verdict. OK lah.... not bad.